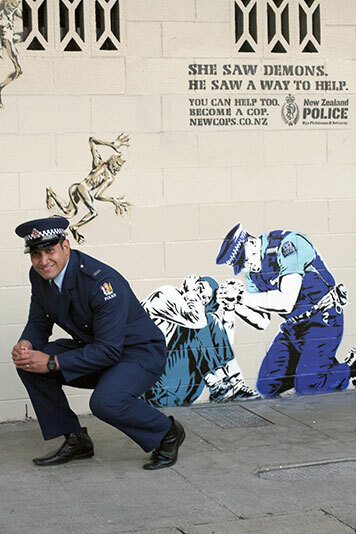 Constable Lio Kaihau on being a Christian Police officer. While on duty on a cold Friday evening in West Auckland, Constable Lio Kaihau got the message to attend to an incident where a young woman was agitated and threatening to end her life. As a police officer, Lio was asked to go and see the woman, get her safely to hospital for observation, and make sure she got home securely if given clearance to leave. But from the moment Lio saw this young woman, he knew immediately there was a lot more going on than met the eye. After taking her to hospital, the young female was still reluctant to speak to Lio. Technically speaking, he had fulfilled his duty by accompanying the woman to somewhere she could be examined by a mental health team. But Lio—a committed Christian—felt it couldn’t just end there and that this was an opportunity for someone to be helped by the power of Jesus. He also felt that if he left without using the opportunity to share his faith, he would later regret it. All of a sudden, the woman started to talk. She told Lio that she had tried to go to church before, but it didn’t go well. She then told him that many people had previously tried to help her through her issues, but whenever she told them what those issues actually were, she would never see or hear from them again. That’s when Lio got straight to the point. ‘When she told me those things, I simply said to her, “To be honest, the only person that can help you right now is God,” ’ explains the Tongan-born officer. Realising Lio was genuinely trying to help, the young woman opened up further, telling him more things that were happening to her at the time, including how she saw demons crawling on her bedroom walls nearly every night. She added that she had tried to read her Bible to combat these attacking demons, but that she would wake up in the morning and find her Bible in the toilet, without having the slightest idea of how it got there. Shortly after their prayer, the young woman was cleared to go home by the hospital’s mental health department. The reason Lio persisted with helping the woman, even though she wasn’t interested in talking to him, is because he believes his godly calling to be a police officer does not just involve ‘police stuff’, but is also about being ready to help people get back on their feet by drawing on the power of Jesus. ‘I really want to help people, and I know that’s God’s calling for me,’ Lio explains. ‘That is one of the main reasons why I joined the Police. Helping people on the street, giving them the right advice and just putting them in the right direction is what I really want to do. New Zealand Police Christian Support Network co-founder and co-national coordinator Inspector Fiona Prestidge says Lio’s actions on that night were typical of a Christian police officer going beyond their duty to help someone in need. Fiona says Lio’s story wasn’t a one-off. Many officers reach out and offer to pray for people, she says. They also offer help in other ways, a portrayal of God’s love and hope from a follower of Jesus. ‘As a Christian, you know God knows you and loves you, and that gives you a deep well of resource that you can offer other people,’ says Fiona. ‘Whether it’s a victim or the most screwed-up, awful offender, you know that God’s love reaches out into that situation, too. Despite Christian police officers being able to make a considerable difference in people’s lives, Fiona does admit that working within the Police can hinder people’s walk with God. Shift work deprives police officers of regular connection with other Christians, and friends and families don’t always understand the unique challenges of police life. This is one of the main reasons the New Zealand Police Christian Support Network was established seven years ago, she explains. There are currently around 550 police officers connected to the network. ‘We set up the network in recognition of some quite distinct challenges of what it’s like to be a Christian in the Police, such as isolation,’ says Fiona. ‘For example, just say you leave Police College and you’re straight into shift work. That can easily keep you away from attending church or home groups and all those things you would have done to help you grow. Although things officially got underway seven years ago, Fiona says it wasn’t until October 2009 that the network started to see real momentum in membership numbers when they held their first national conference. The conference was an instant success as it gave officers from around the country the opportunity to meet other officers who share the same faith as well as to exchange contact details so they could connect with each other. Since then, four national conferences have been hosted, along with a regional conference in Canterbury in support of colleagues after the February 2011 Christchurch earthquake. Helping stop a young woman from committing suicide would be an worthwhile chapter in anyone’s book. But there is more to Lio’s tale. After he helped the young woman on that particular Friday night, Lio invited her to go to church the following Sunday with him and his partner. He was pleased when she accepted the invitation. But there were surprises ahead. When they arrived at church, Lio kept telling himself, ‘As long as we get through those doors, I know everything will be alright’. And he was right! Lio looked over his shoulder once the worship started to find the woman taking off her beanie and sunglasses. That’s when Lio knew God was at work. The pastor of the church continued to pray for the young woman when, in a sudden turn of events, she began swearing and cursing Jesus’ name again. The pastor continued to pray for her, asking God to set her free from whatever was pushing her to do that. Once she calmed down, Lio took her home. From there, a couple of leaders from the church kept in touch with her for the next month. Lio didn’t see her during that time, but when he did see her again, he was in awe as he saw a completely different person. The woman said later of the incident, ‘Police officers are often known for locking people up, but it was Lio who unchained me from that horrible dark place’. Lio protests, explaining that it was God who unchained her. ‘I’m just thankful that God used me to help,’ he says.